Spring is here. At least according to the calendar. It snuck in yesterday and it was a mild day. I think there might have been some rain. I was out doing grocery shopping while battling a bout of sciatica which has me moving and feeling way outside of my age. Inside, I have two orders to complete. 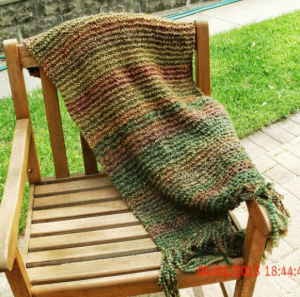 One is for a prayer shawl, like this one draped across the chair. The color is called herb garden and I am due to have it in the mail today, despite the discomfort. I enjoy knitting prayer shawls because they seem to have a purpose other than being a shawl. There are times I get the back story when someone orders a shawl. I don’t have the story of this one but it wasn’t rushed so I am feeling fairly tender thoughts when knitting it. This is a simple knit, garter stitch all they – and using multicolored yarn lets the fiber to all the work. That helps in making this a calming knit but it’s also knowing most people order this shawl to get them closer to the spirit or to help ease someone else’s discomfort. That means something. I didn’t do as many prayer shawls in 2018 as I did in 2017. Perhaps folks are feeling more hopeful. Maybe the prayer shawls in 2017 did their work so there weren’t so many needed in 2018. They will return to the shop in 2019 and I am adding another prayer shawl to go with them. The shawl I talked about in the last post. It is being made with a different yarn that changes colors and it is a big, triangle shawl. The pattern will also be available. Spring brings new promise. The flowers are already breaking through the ground and the days are longer and lighter and will get warm. Knitsville folk will put down their needles and hooks – periodically – to go play in the dirt and plant colors they can only dream to knit with. Spring Come to Knitsville – it’s welcome. There are no bad days to knit; but we do like spring around here. We can knit outside.